태릉은 조선 제11대 중종(재위 1506∼1544)의 세번째 왕비인 문정왕후 윤씨(1501∼1565)의 무덤이다. 본관은 파평으로 중종의 두번째 왕비인 장경왕후가 1515년 죽자 1517년에 17세의 나이로 왕비가 되었다. 중종이 있는 정릉에 묻히려 하였으나 장마철 침수로 인하여 이곳에 묻히게 되었다. 무덤은 십이지신과 구름무늬가 새겨진 12면으로 된 병풍석이 둘러져 있다. 무덤 앞에는 상석·망주석 등이 『국조오례의』에 따라 제작되었다. 무덤 아래에는 한국 전쟁시 훼손되었다가 1995년 다시 지은 정자각이 있다. 사람모양의 돌조각상(석인)은 4등신으로 입체감이 표현되지 않았는데, 당시 석인의 특징을 보여준다. 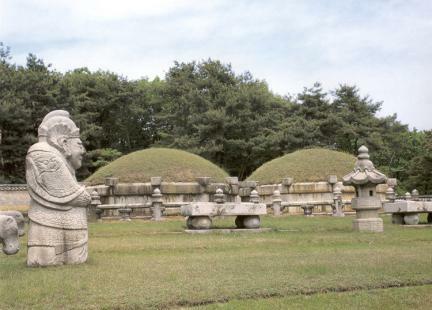 강릉은 조선 제13대 명종(재위 1545∼1567)과 그의 부인인 인순왕후 심씨(1532∼1575)의 무덤이다. 태릉과 같은 병풍석이 둘러져 있다. 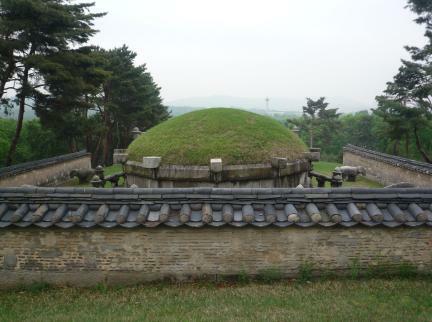 This is a royal tomb called Taereung where the second queen of King Jungjong, Queen Munjeong, is buried. 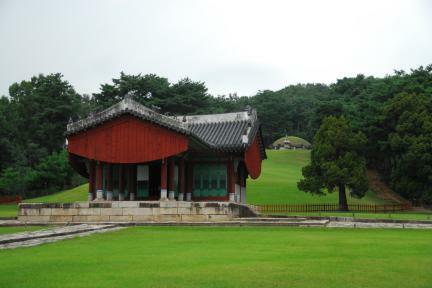 Queen Munjeong, whose family originated from Papyeong, became the second queen at the age of 17 after Queen Janggyeong, the King’s first wife, passed away in 1515. 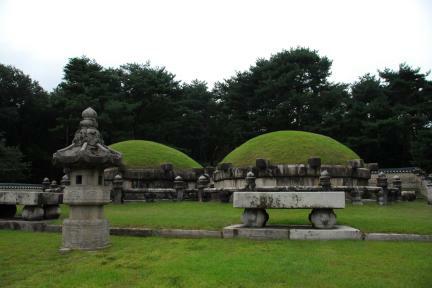 King Jungjong wanted to place her grave at Jeongneung but she was buried here because of the possible submersion of Jeongneung during flooding. A twelve-sided stone screen engraved with the twelve zodiac animal deities and cloud patterns is drawn around the tomb. 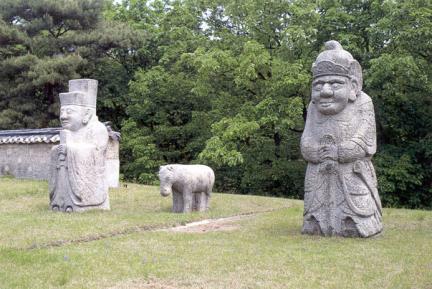 Other stone sculptures are placed in front of the tomb in accordance with the book of national ritual guidance. 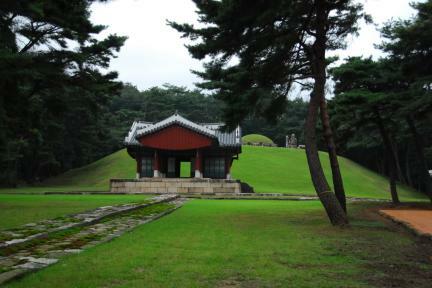 There also stands a T-shaped shrine which was destroyed during the Korean War but rebuilt in 1995. The typical style of figurative sculpture is proportioned into four and the cubic effect is absent. 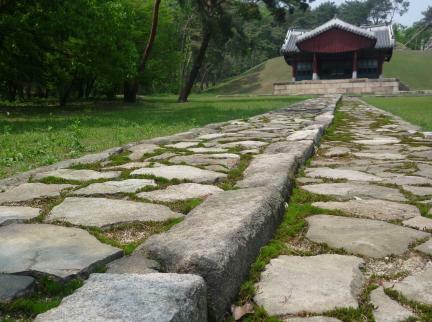 Gangneung is the tomb where King Myeongjong, the thirteenth king of Joseon, and his wife Queen Insun are buried. After the queen died, her grave placed next to the king's. 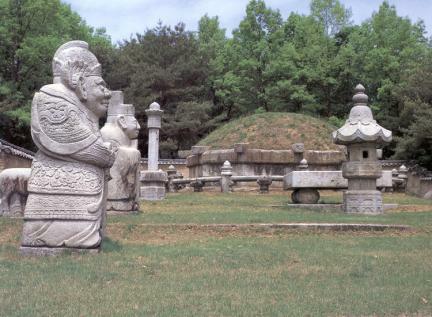 As in Taereung, the tomb is embosomed in in stone screen. 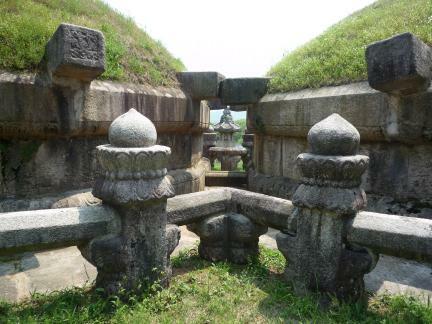 The stone lantern Jangmyeongdeung shows the retro tendency that was popular in the 16th century.